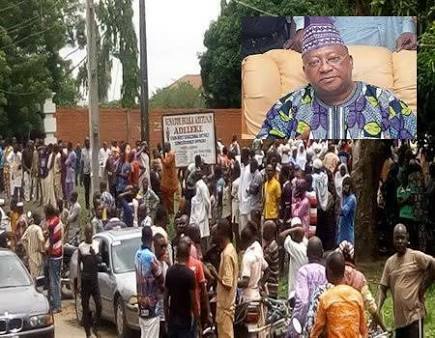 Osun state chapter of the People’s Democratic Party has described the sudden death of the first Executive Governor of Osun state, Senator Isiaka Adeleke as shocking and very devastating. The party has therefore declared a 3-day mourning and an immediate suspension of all party activities across the state while the PDP flag will be flown at half mast in honour of the former governor who was once a senator on the platform of the party. A release issued today by the State Chairman, Hon. Soji Adagunodo described the senator representing Osun West Senatorial District in the National Assembly as a grassroots politician whose impact on the life of the people was noticeable and remarkable. Hon. Adagunodo said the death of Senator Adeleke in the early hours of today marks the end of an era in the annals of Osun state. According to the PDP chairman, the late senator was unequalled in Charisma, generousity and courage and will be missed across party lines. He added that his brief tenure as Osun State Governor witnessed remarkable achievements in all spheres while his subsequent contributions to the development of the state was undeniable. While condoling with the Adeleke family of Ede and the entire people of Osun state, the state PDP prays that the Almighty Allah will grant eternal rest in Aljanah to the late Asiwaju of Ede and comfort his entire family and associates. Hideout where Notorious Kidnapper, Evans Keeps His Victims. Kindly Worship with us @ Christ of The World Ministries.